Sonohyan Utaki Stone Gate was a place of worship for the King during the Ryukyu Kingdom era. It is located along the road behind Shureimon. When the king left the castle he would pray there for a safe return. 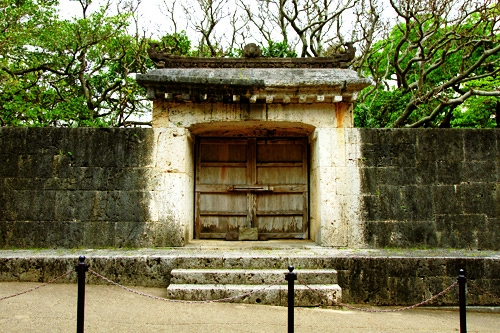 This is also the first place of worship that the King would visit when leaving the castle for pilgrimage or for the inauguration of the Ryukyu supreme priestess, the Kikoe Ogimi. Except for the door, this undulating bargeboard gate is completely made of stone. However, with its sculpted bargeboard pendants, it gives an impression of being constructed of wood.